Black Women and how we deal with trauma - Is it working? Exploring dreams, mental health, abuse and sedition; Still Barred is a lyrical theatre piece centred on four female prisoners' psyches playing puppet to a punitive overpower known as Reality. Award Winning Artist & Royal Court Young Writers Alumni Damilola K Fashola is also the writer of Zarascasket (RADA festival 2015) and the creator of London’s first theatre, short film and dance festival showcasing the works of British creatives of colour: Melanin Box. 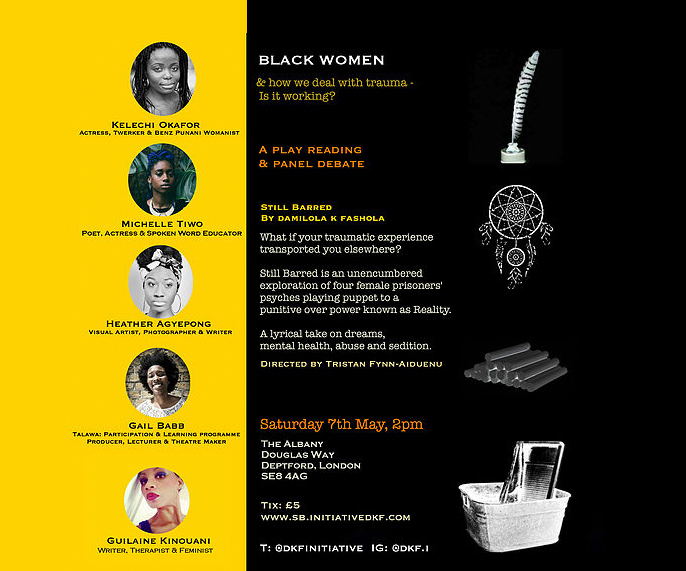 Kelechi Okafor: Actress, Twerker and Benz-Punani Womanist • Michelle Tiwo: Poet & Actress (Ackee & Saltfish) • Heather Agyepong: Visual Artist, Photographer &, Writer • Gail Babb Talawa: Participation & Learning programme Producer & Lecturer • Guilaine Kinouani: a race, culture & equality consultant with an MA in Transcultural Mental Health & blogger at racereflections.co.uk. Initiative.dkf is a creative arts collective specialising in theatre, visuals, and dance. The platform is a synergistic body of creatives redefining what it means to be creative, black and British.